The Uprising of '34 (1995) documents the General Textile Strike of 1934 with verve and passion. 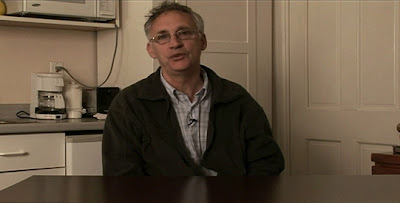 Filmmaker George Stoney (above) draws out the story from a variety of witnesses. 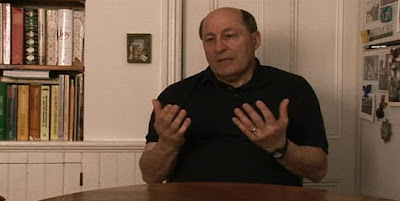 The film demonstrates the value of big oral history projects when they are well-edited. Union Maids (1976, by filmmakers James Klein, Miles Mogulescu, and Julia Reichert) is an oral history of the labor movement in 1930s Chicago, beautifully told by three women labor organizers. 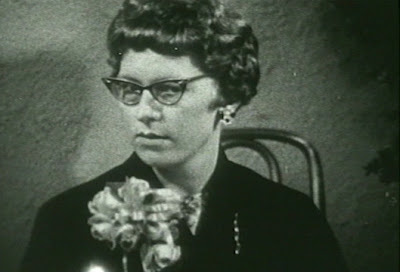 Archival visuals complement the black-and-white interview footage. We get a sense for the dynamism and drive of the worker/activists of the day. 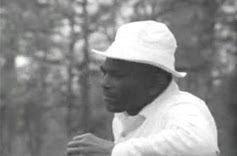 Afro-American Work Songs in a Texas Prison (1966) stands alone as a unique document of work and singing on a plantation at the Ellis Unit, Huntsville, Texas. The film is available on Folkstreams with a variety of useful materials including how it came to be made. Produced by Pete and Toshi Seeger with Bruce Jackson. Les Blank is a masterful cameraman. He's self-confident enough to sometimes frame his subjects without slavishly adhering to the "rule of thirds." (Above, from Always for Pleasure, 1978, showing objects on a mantel and decorating the walls.) It's usually better for new videographers to stick with the basic standards of composition. A problem with using artificial lights in camcorder documentary work is overlighting. 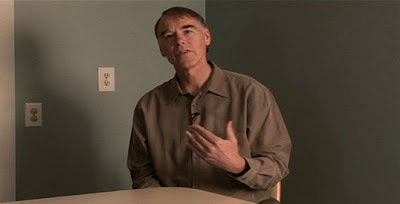 The standard lighting techniques for shooting an interview often suggest a key light, a fill light, a background light, and a light for defining the back of the head. That works fine, but at times, the light on the back of the head is overly bright. The result is an interview subject with "Kramer" hair, as seen in the TV show, Seinfeld. It's an easy shot that you see all the time, not just in student work: the view of a neighborhood from the passenger's seat of a moving car. The camera's gaze out the window from a car (or train) can give a film the condescending feel of a safari documentary. The footage implies that the streets are so unsafe that the filmmaker can't get out of the car and walk around. A passenger with a camcorder in the back seat of a car has a particular and recognizable point of view. 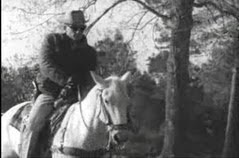 Top, a student video. Although it's not a documentary, Rainer Werner Fassbinder's Warum läuft Herr R. Amok? (1970; Why Does Herr R. Run Amok?) uses the same shot (bottom). Title: student video, Why Does Herr R. Run Amok? A NYC appearance by the Rolling Stones during their "A Bigger Bang" tour is thoroughly documented by Martin Scorsese in Shine a Light (2008). The wrinkly but very high-energy band is the focus of the film -- few audience members are shown (in contrast to Town Bloody Hall or A Perfect Candidate) and the only visible ones, in the front rows, look like models hired for the occasion (bottom still). The "coverage" is phenomenal, with plenty of cameras capturing multiple angles. This over-the-top blanket-bomb coverage pays off with several lovely sequences, such as the "Champagne and Reefer" performance with Buddy Guy (middle). 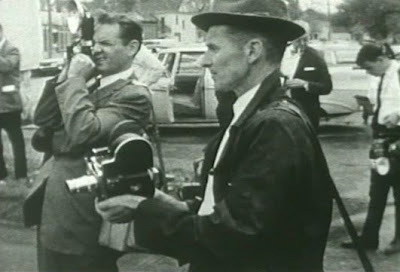 Albert Maysles (top still) shows his hand-held, chest-high camera technique. Barbara Leibovitz, taking advantage of seemingly unfettered access to her subject, films her older sister in the public television American Masters program, Annie Leibovitz: Life Through a Lens (2006). 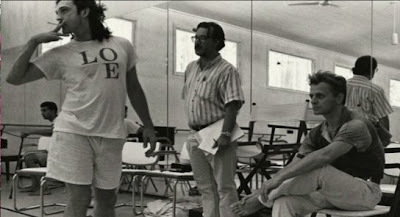 The flattering and family-infused documentary parks itself miles away from critical thinking and controversy, while showing some of the more lasting and worthwhile aspects of Leibovitz's career. 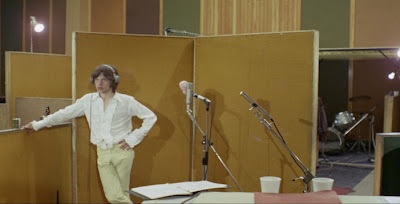 Two notable examples are her months-long photo documentation of the Rolling Stones 1975 tour (top and middle stills) and her deep interest in taking pictures of dancers and choreographers (Mikhail Baryshnikov and Mark Morris -- bottom still). 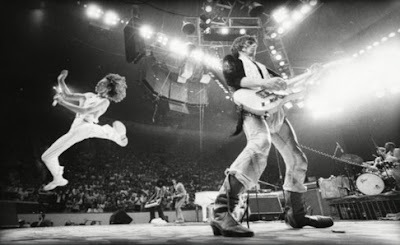 Cocksucker Blues, its name usually bowdlerized and its content rarely seen and therefore misunderstood, documents the 1972 Rolling Stones tour of the US through the eyes of photographer Robert Frank. He includes wanton lechery and overindulgence of every possible kind, with some material shot by the band and its entourage with 8mm film cameras. Although the film is decidedly not "high def," the behind-the-scenes footage holds fascination. There's clowning around, getting ready for the shows, boredom in motels, hanging out backstage with roadies and celebrity visitors, and road tripping through Robert Frank's America. Performances appear to be shot with a single camera, giving them an all-access-backstage-pass beauty of their own. Above, the disclaimer at the start of the film, Mick Jagger, Stevie Wonder, Andy Warhol. 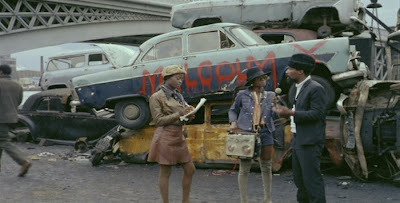 The 1970 film, Gimme Shelter, directed by the Maysles brothers and Charlotte Zwerin, documents the events leading up to the Rolling Stones concert of December 6, 1969 at Altamont Speedway. 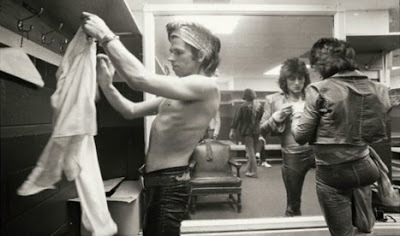 While the Stones played their set, a young man named Meredith Hunter was killed by a member of the Hell's Angels. Cameraman Baird Bryant caught the scuffle and stabbing on camera. A fascinating and passionate account of the making of the film and its fallout was written by an insider, Stanley Goldstein. 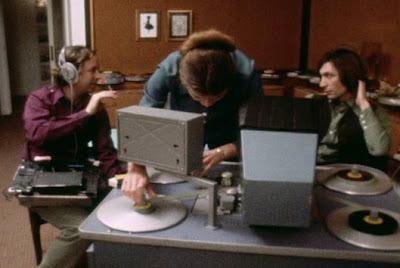 Top: David Maysles with Charlotte Zwerin at the Steenbeck discussing the footage with Charlie Watts. Middle: Tina Turner. 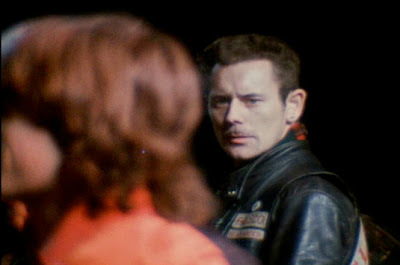 Bottom: A leader of the Hell's Angels watching Mick Jagger on the Altamont stage. 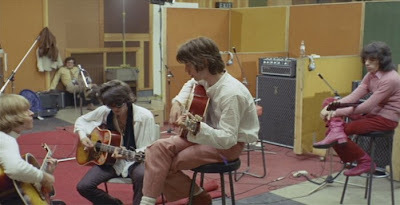 This 1968 film documents the Rolling Stones in the studio, working on one particular track from the Beggars Banquet album, "Sympathy for the Devil." The heart of the movie is the endlessly fascinating tinkering and invention among the musicians, explored with smooth camera moves and a skill for eavesdropping. The fun of watching the young Rolling Stones is frequently interrupted by Jean-Luc Godard's preoccupation with all "ism's" of the day. Godard's rhetoric and imagery in a series of fictional episodes are florid and dated compared to the freshness of his documentary footage. 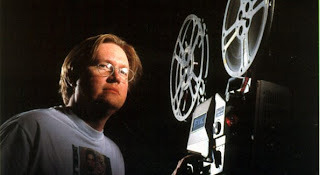 Skip Elsheimer aka A/V Geeks collects, preserves, and showcases educational films of every kind. His twin DVDs of curated films, How to be a Man and How to Be a Woman, will be released by Kino on October 6, 2009. Robert A. Nakamura had been sent to the concentration camp for Japanese Americans at Manzanar when he was a boy. He reflects on his memories in Manzanar (1972), a 16 minute short. The visual texture of the film centers on melancholy scenes of Manzanar's ruins in the Owens Valley and archival material from the 1940s. Nakamura's use of signs (such as the two examples, above) are particularly moving. 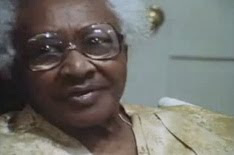 The Angel that Stands by Me (1983) by Allie Light and Irving Saraf, documents North Carolina visionary artist Minnie Evans near the end of her long life. 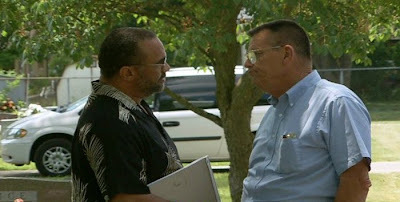 The film, 29 minutes long, is available to watch at Folkstreams.net, along with a transcript and other information. 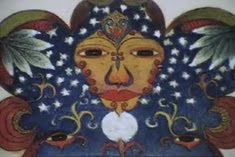 The film beautifully connects Evans's art with her family, with her work as a gatekeeper (from 1949 to 1974) at Wilmington's Airlie Gardens, and with her spiritual life. 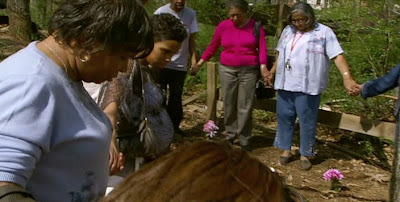 Banished is an enlightening look a set of now-100% white American communities that, during the Jim Crow era, forcibly removed African American landowners and stole their property. Marco Williams documents several cases of this ethnic cleansing, intrepidly exploring some unexpected ambiguities. One of the wronged descendants, for example, loses our sympathy when he tries to avoid paying for the exhumation of a grave (bottom still). A lush soundtrack features the great saxophonist David Murray. Wild Wheels is an rollicking series of portraits of art cars and their creators. Filmmaker Harrod Blank studies, documents, and builds art cars, so his connoisseurship gives the film extra depth. The grass car sequence (above) is one that I've frequently shown to students as an example of editing together an interview (in this case, of the car's creator) with a process (the visual documentation of each step of "growing the car," from planting grass seed using adhesives to watering and nurturing the car as the sprouts turn green). When We Were Kings (1996) transports the viewer directly to 1974's "Rumble in the Jungle:" the fight between Muhammad Ali and George Foreman. 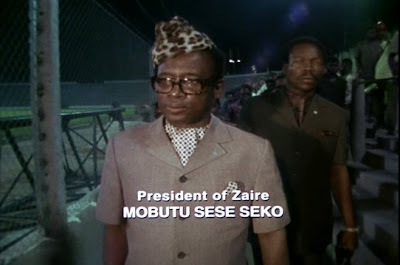 Expressive footage from several cameras includes the then-ruler of Zaire, Mobutu Sese Seko, as well as local people and performances. All of these elements are edited together into a well-paced story. 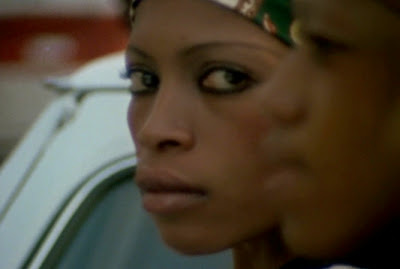 The 2008 documentary, Soul Power, further explores the music festival that accompanied the boxing match. Emile de Antonio's In the Year of the Pig (1968) is a comprehensive and riveting damnation of foreign entanglements in Vietnam. The ignorance and folly of the French and Americans is set out with deeply-researched, hard-won archival footage, devastating interviews, and unusual soundtrack choices. Were the thuwp-thuwps of helicopters on the soundtrack, for example, an influence on Coppola's Apocalypse Now? Visual images, of protesting monks (top) and hooded prisoners (bottom) in In the Year of the Pig foreshadow those from Burma (as in the documentary Burma VJ) and from the Abu Ghraib prison. Kevin Rafferty was the one-man crew for his thoroughly entertaining documentary, Harvard Beats Yale 29-29 (2008). 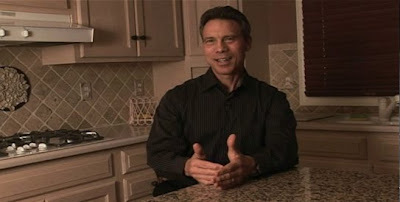 His interview set-ups have a homey, improvisational look, with an in-the-kitchen comfort that must have put his interviewees at ease. Rafferty did his own editing as well, allowing 1968 television footage of the game to run without unneeded interruption. Besides the fun and suspenseful explication of one memorable football game, the documentary offers a revealing look at a group of privileged 60-year-old men and the beyond-campus turbulence of that 1968 year. Update: An alert reader pointed out a great interview with Kevin Rafferty, by Connor Ennis for the New York Times. Richard Leacock and Joyce Chopra's Happy Mother's Day (1963) is an engrossing film about a mom who just gave birth to quintuplets and the exploitation that dogs her every move. Today's television hoopla surrounding multiple births shows that very little has changed when it comes to commercial opportunism and self-serving hot air. In this film, though, the Fischer family come across as sensible people who will outlast their temporary notoriety. A fond humor for small town Americana hovers over almost every shot, a warm visual counterpoint to the somewhat sarcastic narration.